The postman picks up our bags around 14:30, Monday to Friday. If we receive your order before lunch, we can usually send it out the same day. Later orders will go out the next day. If you have any special shipping requests, please let us know and we will try to oblige. We are happy to advise you on shipping options and costs for your order, depending on your destination and the service required. All order to the US are sent airmail and usually take a week to arrive. The whole postal business is really quite marvelous, is it not? More than 80.000 Plurabelle parcels delivered all over the world, and yet, there always is a worry and a concern about what may happen when your parcel leaves our premises. Indeed, we too think about the post every day: Will it come, will it go, will our parcels arrive at their destination safely? We are a postal business, and we live with the ins and outs of postal communication every day. And every night. The boff at the corner, the student next door. Letters of refund and invoices to pay. You send us the order, we pack the book, and a few days later you have the book on your desk, anywhere in the world. Marvellous really. Amazing. Today on our shelf: tomorrow on yours. And they almost always do arrive. (Click for list of titles on transport and postal history) Say after me: "Achievement of civilisation". But of course things can go wrong. 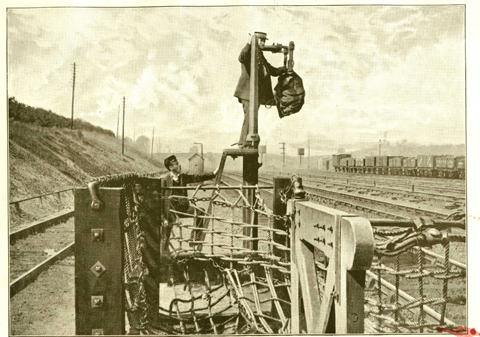 The marvellous system of postal transport does have a few weak links, like the apparatus that is used to take in and deliver mail bags from and to trains in motion (London and North Western Railway at Bletchley, 1910).